ROAD TOWN, Tortola, VI – Radio host and Social commentator, Kaream K. Pickering aka 'Picko Moff' is of the view that for the National Democratic Party (NDP) to ever have a chance at power again in the Virgin Islands (VI) they will need new faces and a stronger leader. On the Tuesday April 8, 2019, edition of ‘Hard Talk’ on Tola Radio VI with co-host, Julio S. Henry, Mr Pickering further charged that the current Opposition Leader, Hon Marlon A. Penn (R8) is a ‘puppet’ who lacks leadership qualities, and this was evident when he allowed himself to be led by the embattled Chairman of the NDP, Mr Myron V. Walwyn ahead of the 2019 elections in the VI. “Marlon is a puppet, Marlon is not a leader… I like Marlon, he’s a good person, he’s a good brother, but he’s not a Leader, he’s not a go charge [person],’ Mr Pickering told his listening audience on Tuesday evening. According to Moff, “If Marlon had stood firm and not let Myron lead him, I could have said this is a leader, a man that stands behind principles, a man that will not be turned. I could have said that and I would have rallied for Hon Penn,” he revealed. When question by co-host Mr Henry on whether the current faces of the NDP let by the Opposition Leader can have a chance at power, he implored that for that to happen, the NPD would have to get rid of all their current players. “Form a new government with a new set of faces, not a new set of puppets, new set of faces that’s if this government [VIP] don’t do good,” Pickering said. According to the outspoken radio host, the NDP is yet to demonstrate that they care for the Territory, as he pointed out instances where major projects were started only close to elections as a ploy. 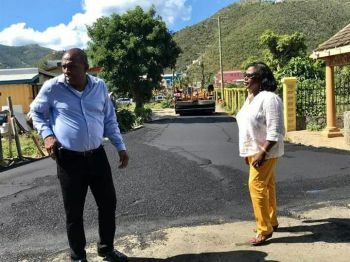 “They say they care, but all what they could have fixed with all of this money, they did nothing with it and then they come to pave road that already paved while the fireman still up there getting sick, the people them in the complex still getting sick, VG Government Building still mash up, several places still mash up,” he said. Mr Pickering implored, that he intends to keep the conversation going so that the issue can remain alive in the minds of the people. Budget some funds to fix the problem Marlon who also lives in the East and is affected by the sewerage watched Mark break protocol and use $8 million to put in the Pier Park. Does that sound like a leader. He ran with that same team when they didn’t care about him and his constituents. A leader would have fought that move until the end. That was cause to make yuh mouth big and bruk up the party. Julio should be ashamed of himself. If it was not for the NDP he would have been walking around led by someone holding his hand. Thats my tax payers money given to him! Talk Julio Talk! you aint got no sense. They keep regurgitating the same o with out being prompted. OK,understandibly you feel threatened and us obsessed by the intellect energy and suave of the gentlemen of NDP. but enuff ,please..cut to present mattters...like how the current Premier is demonstrating his lack of leadership by not appointing a Deputy and why,if tis true,he,said Premier unlike predecessors has a 24 hour personal body guard and who is paying the bill . This little boy is looking attention ..just stay off the radio..
Two big CLOWNS picko./Henry.Ask what are they bringing to the table other than breading hatred.Mr. Penn is a gentleman in all respect.What u 2 is doing is the essence for division among us BVI Islanders.Talk about unison to move country forward man not no negative crap. Moff this is a free country and you can speak freely for the next 4 years. 1. The sewerage plant Paraquita Bay built more than 3 years and not one house connected to it as yet. NDP used, diverted funds and overspent funds and the sewerage plant still not in use. 2. The 8th district street lights in East End, across the Bridge and on Beef Island needs replacing after hurricane Urma. The road to the Balsum Ghut Prison needs repair. The time wasted talking about NDP/VIP Politics is useless unless the opposition is serious about moving forward. Leader of the Opposition show some leadership and get your district fixed. You said it best. “Show leadership and get the district fix” I have noting against Mr. Penn but I would love if he did just that.